The usage of mobile phone as well as its advantage in terms of utility has increased manifold. Easy and fast communication apart from text messaging and multimedia applications in mobile phones has made it a compulsory addiction for many, particularly, youth. But the health hazards associated with this addiction are a serious cause of concern, especially in people who are at risk for their life because of their occupation. Driving is one such occupation  where the driver is exposed to environmental pollutants and outside smoke throughout the day. 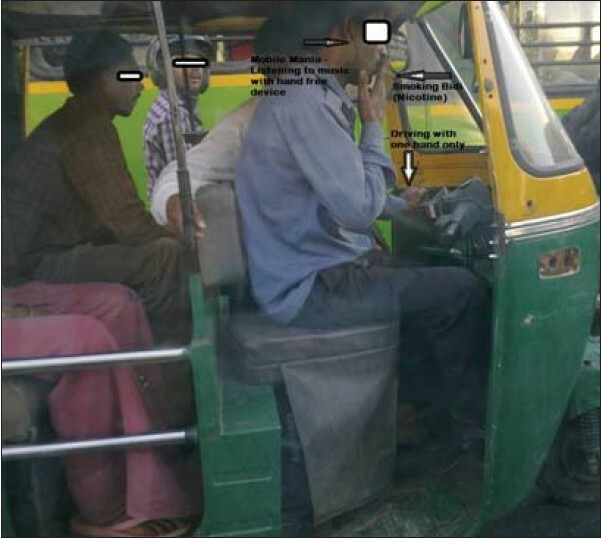 If this subgroup of population smoked and used mobile while driving, then the combined effect of stress from driving, passive smoking from the environment, self smoking, and reduced attention by use of mobile while driving makes them accident prone [Figure 1]. This particular gentleman was noted to be smoking bidi as well as talking on a mobile phone while driving on a busy metropolis road. He was not only subjecting himself to risk but also to others on the road. The reduced attention span on his part makes him accident prone. The reason for reduced attention while smoking and driving may be due to shortage of oxygen, the presence of carbon monoxide, and high concentration of fine particulate in the air breathed inside the vehicle. The belief that hands-free use of mobile phone is safer than hand-held mobile phone is false, as both are equally hazardous in reducing performance and attention while driving. The ill effects of smoking may take months to years to kill, but talking on mobile while driving may cause instant death by accident. 1. Pedrero Pérez EJ, Rodríguez Monje MT, Ruiz Sánchez De León JM. Mobile phone abuse or addiction. A review of the literature. Adicciones 2012;24:139-52. 2. Wong CK, Fung CS, Siu SC, Wong KW, Lee KF, Lo YY, et al. The impact of work nature, lifestyle, and obesity on health-related quality of life in chinese professional drivers. J Occup Environ Med 2012;54:989-94. 3. Mangiaracina G, Palumbo L. Smoking while driving and its consequences on road safety. Ann Ig 2007;19:253-67. 4. Ishigami Y, Klein RM. Is a hands-free phone safer than a handheld phone? J Safety Res 2009;40:157-64.